Nazi Aufmarsch Stoppen! Nazi´s wegbassen! Mi, 06.06. - So, 10.06. The new Pocket Party Guide Mit dem neuen Heftlayout haben wir die einzeiligen Partyeinträge rausgeschmissen und Ihnen als 3-zeilige Partyinfos in einem Faltflyer ein neues Zuhause gegeben. Diesen Flyer bekommen ab sofort unsere Abonnenten. Ein Abo bekommst Du bei mushroom-magazine. com/shop Wenn Du mit Deinem Event in unserem neuen Partyplaner aufgenommen werden möchtest, trage Dich doch einfach ab 49 € ein unter www.bit.ly/party-entry. Den kostenlosen Eintrag im Pocket Party Guide bekommst Du automatisch, wenn Du Deine Party bei goabase.com mit der Option „Partyinfo to mushroom magazine“ einträgst. With the new magazine design we kicked out the one line party entries and offered them a new home in a folded „Pocket Party Guide“ flyer exclusive to our subscribers. Get your mushroom subcription at mushroom-magazine.com/shop. If you would like to be inside our regular printed partyplanner with your event just make your entry from 49€ at bit.ly.com/ party-entry. 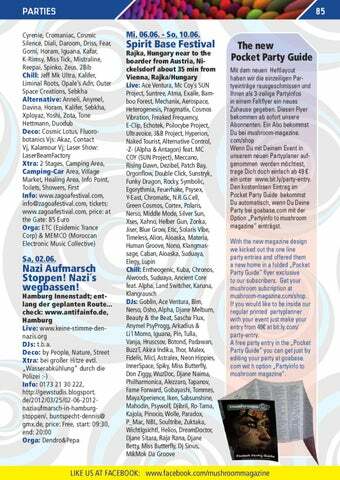 A free party entry in the „Pocket Party Guide“ you can get just by editing your party at goabase. 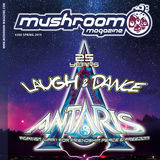 com wit h option „Partyinfo to mushroom magazine“.